I've reviewed Muvizu before and recommended it to friends as a low cost entry point to 3D, drag'n'drop, animation. 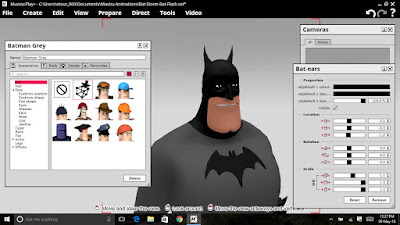 It's very much like a simplified version of Reallusion's iClone6 and, at just over AU$50.00 for the full licensed version, which includes commercial use, hard to pass up. As easy to use as Muvizu is, it can also grow with you as your skills improve. As you get more familiar with the software you'll discover just how customizable everything is. I recently decided to purchase a Muvizu license and found, among the additional character styles unlocked, some really cool, stylized action superhero characters. 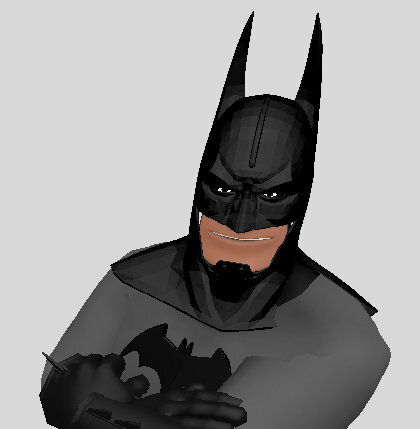 Naturally, I decided to make a Batman character... because... Batman! Turns out you can get pretty close to a good looking, cartoon style Batman with the superhero male character (known as 'Beefy'). A great feature of the 'beefy' character is you can add a cowl of any color just by adjusting a setting in the character properties. Unfortunately the cowl doesn't have bat ears and there's no hat prop featuring ears (or devil horns, which the female hero figure has, that can be colored black to make a good set of bat ears). Everything else on my Batman figure is stock content, including the spiked gauntlets and cape (no chest bat logo though, which the female figure also has). Muvizu has a thriving community that shares quite a bit of their customizations for free. Not having ears for my Batman I decided to look around to see if anyone had made some. I didn't find any ears but came up with this amazing custom cowl made by clayster2012. 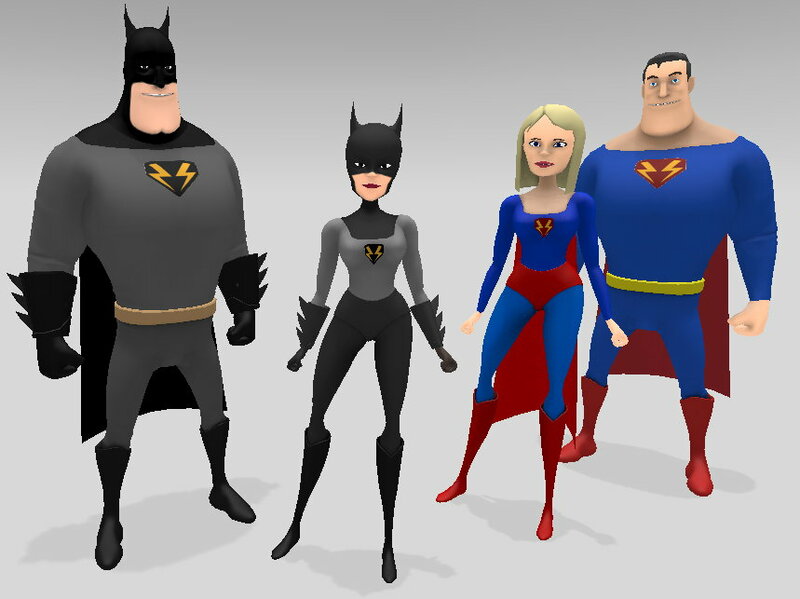 If you want it you can download it for free as part of an entire set of Superheroes clayster has created. Check them out - there's even Hawkman with full wings! Clayster2012's cowl looks amazing but you'll notice in the image above that, as soon as the character turns his head, part of the cowl's shoulder disappears into the character's actual shoulder. The cowl also limits the type of jawline you can select for your character. I really wanted the exaggerated dimpled chin, which is too big for this cowl. 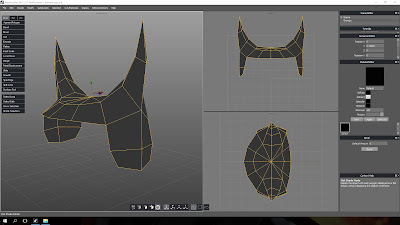 Rather than settling on a cowl I thought this might be the perfect opportunity to make my very first 3D model using Silo2 - a program I spent ages trying to learn and have yet to make anything with. Turns out, I'd forgotten almost everything I learnt about using Silo2 so I had to watch a few videos to get me back up to speed with the basics. 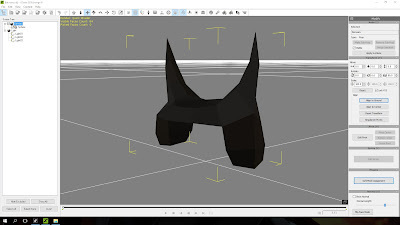 My idea was to just create a set of batman ears that could be used on any character. Kind of like those old Mickey Mouse ear hats. You can see in the image below what I came up with. It's pretty simple but does the job. They're also generic enough that you could use them as devil horns if you wanted too. Silo2 cannot export models in the .fbx format required for Muvizu. To bridge the gap I loaded the .obj scene file into Reallusion's 3DXchange software. 3DXchange is generally used to import/export models to or from iClone but it is also handy as a general conversion tool as well. 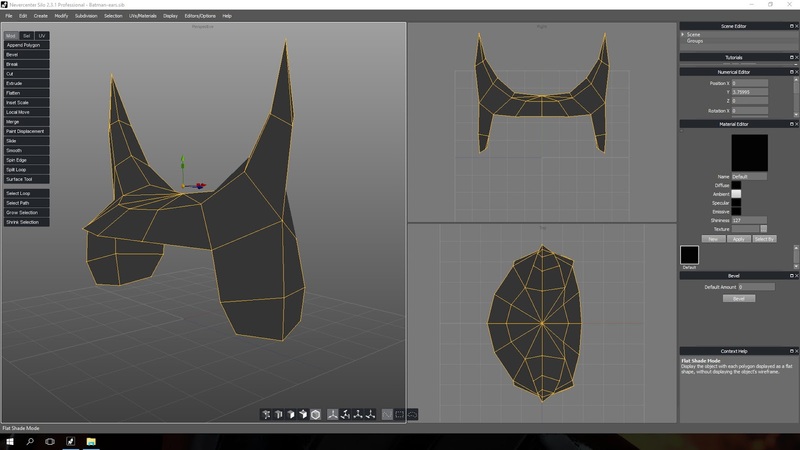 Once my bat ears were in 3DXchange I could size them, adjust the orientation, coloring and make my surfaces two sided as well (if you don't do that last one your model will look transparent when viewed from behind the exterior faces). The next step is to export the model as a .fbx file and bring it into Muvizu. This involves selecting the character you want to wear the model. Then going into the character edit panel and, in my case, selecting the hat option. You can see in the image below, the second option in the panel on the left, of a wire frame cube with an arrow, that you select to load your model. Automatically attaching it to the head. The bat ears in place in Muvizu. From there you use the model's properties palette (shown on the right in the image above) to properly position and size it, as well as matching it to your color scheme. As you can see, by using the character's built in cowl, I've been able to give the character the square jawed, dimple chin I wanted and I don't have to deal with those awkward shoulders of the custom cowl. Having been inspired by my success with the bat ears I thought I'd keep going and create the main cast of my old GoAnimate Bat Storm series. 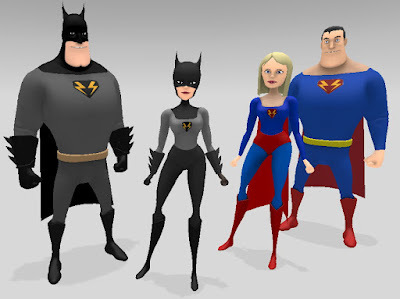 Bat Storm is a Batman v Superman parody that I created back in 2010. All it took was a little bit of work in Muvizu's character editors and a few custom chest logo decals - that are a breeze to add simply by importing them as .png files. You can see the results of Bat Storm 2.0 below. I think Muvizu may just be the ideal platform for a whole new Bat Storm story. Bat Storm, Bat Flash, Charge Girl and Super Charge. Hi David! I have been working on my first Muvizu music video and having a huge learning curve. It is so great to see you are using it, too. Thanks for this nice blog posting and super heroes. Thanks Rocque. I would be interested to see your finished music video. It's still early days for me with Muvizu. I've messed around a lot with character design but haven't really done much by way of animation yet. Hi David, I am looking for a 2d cartoon animation software that work's similar like muvizu, do you know of any software like that? I wanted to create short cartoons (15 to 20 minutes long) for our kids. Do you have any recommendations on a software? Do you reccomend muvizu to create cartoons? Reallusion's CrazyTalk Animator (Version 3 will be released officially later this month) is probably most similar to Muvizu but using 2D animation. You can use your own art with it or shop for characters and props in the Reallusion Content Store and Market place. There's a bit of a learning curve but because you can take advantage of pre-defined motions and automatic lip syncing, once you know what you're doing you can start animating longer animations fairly quickly. It comes in three versions with the standard version being very affordable (US$69.00) and probably all you'll need to create cartoons for your kids. Thank you for your help David! Is the process a lot different from muvizu (lot of drag and drop)? Which one would you recommend out of them two? Hi Brooke, Yes the process is different between the two but mostly because you're comparing apples and oranges... 2D to 3D animation. CrazyTalk Animator will give you more control over your characters. You can use predefined motions to animate them quickly or you can key frame motions entirely from scratch if you can't find the motion you need. Muvizu is limited to adapting predefined motions to your needs. Still very flexible but not enough to be in full control of the animation. Otherwise, I guess the processes are similar. A lot can be achieved in both just by dragging and dropping characters and props etc. In both cases you'll need to team either Muvizu or CTA with video editing software, as both applications are scene editors (animate scenes and export them) and not intended for creating entire 15-20 minute long animations within one project file. Just found your site as well as Muvizo. Trying the test version. It's somewhat tougher than I thought it would be as the video tutorials don't explain that well, but I'm gonna play with it and maybe upgrade. Seems product might not be supported anymore? Anyway, like your site and just bookmarked it. As far as I know Muvizu is very much an active product and is being supported with regular updates and other content. There's also an entire community making custom content too. Once you get more familiar with Muvizu it does get easier. Thanks for bookmarking my site. I hope you find it useful. I haven't done a lot with Muvizu but I do intend to use it a little more often in 2017. I've read from reviewers that the standard version of Crazy Talk Animator is very limited and not worth the price. It depends on what you want to do. I've seen many people complain after buying the standard version that it's missing the features they need even though Reallusion has a version feature comparison chart you can check before you buy. My personal recommendation is to buy the full version if you can afford to, even if you don't think you'll need all the features right away.